Cornbread. 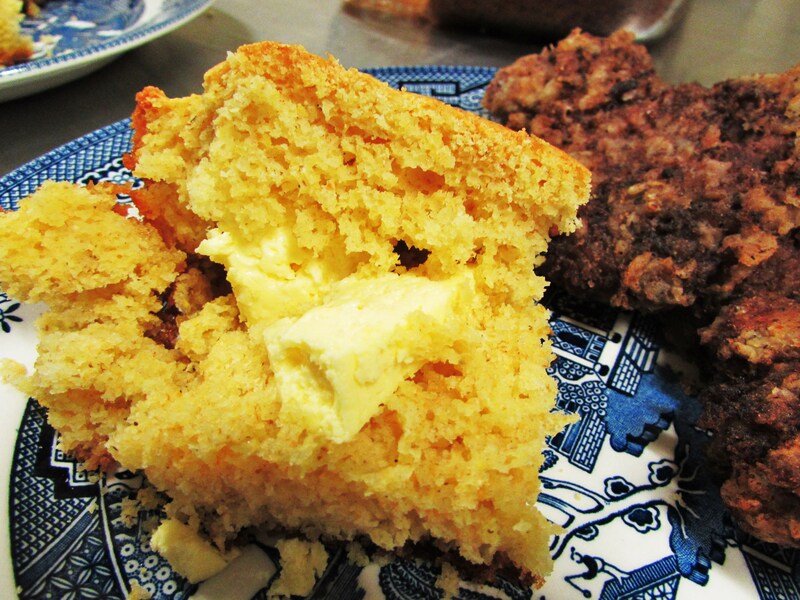 My love of cornbread goes beyond my memory and is embedded in my very soul. I simply can not recall a time I did not adore it. When I was a child I preferred my cornbread with butter and ketchup. And I still, to this day, love cornbread, butter and ketchup. I know, I know, it is really odd and most people scrunch up their nose at the thought, I promise it is good! At least me and my cousin Angela think so…..However, as an adult I have found other ways that tickle my fancy. Cornbread smothered in butter, peas on top with just enough juice to soak the cornbread into a slight mush. Add a dash or two of homemade pepper sauce and …….sigh. It may be country, it may be Southern, but Lord almighty! It sure is good! 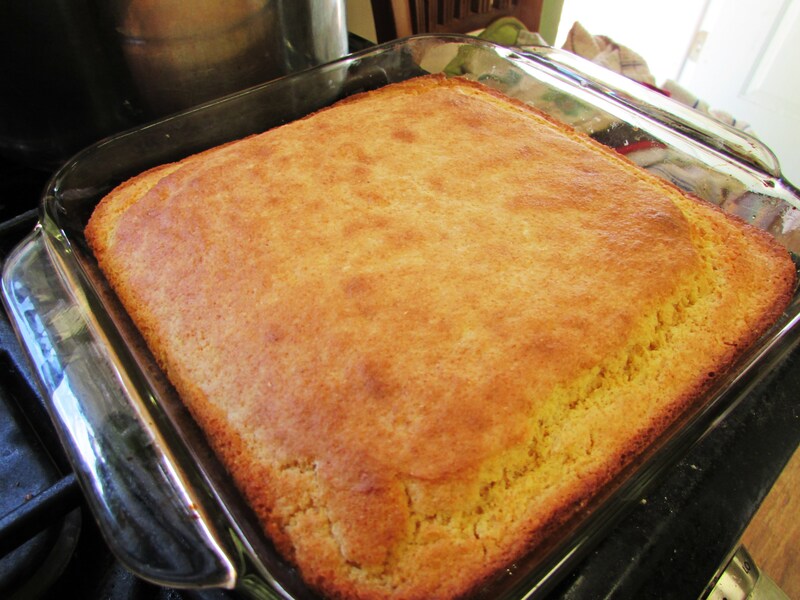 Here is my favorite cornbread recipe, gleaned from an old BMA cookbook, page 52. I’ve had it memorized for years. It is a bit sweet and has a lovely ‘cornbready’ texture. 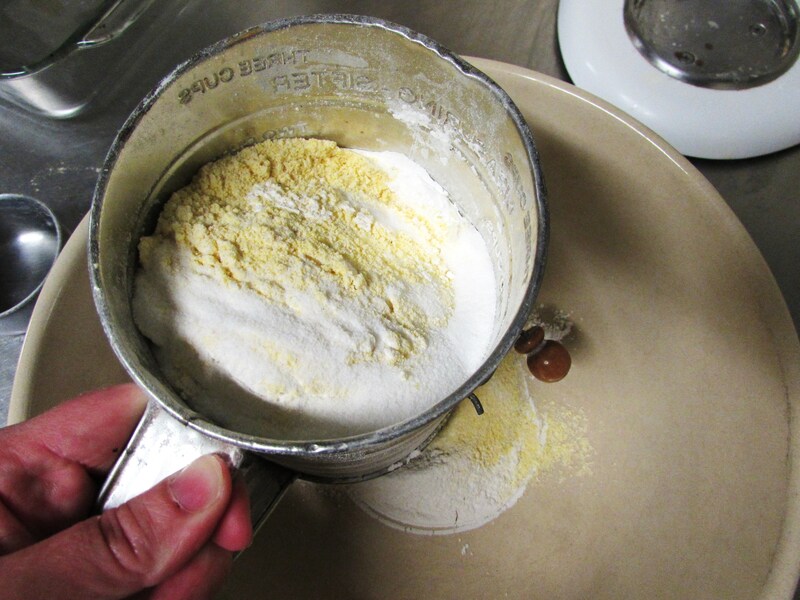 Start by grabbing a sifter, some cornmeal and some sugar! 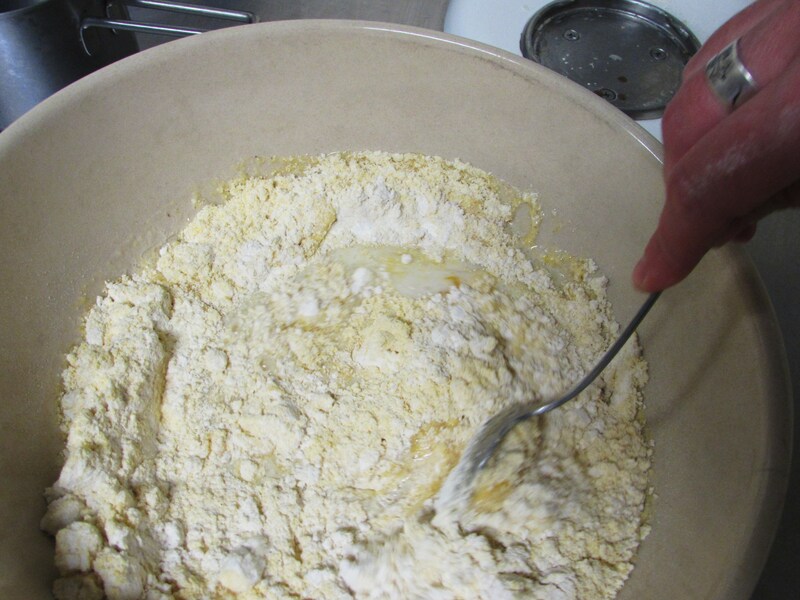 Sift all the flour, cornmeal, baking powder, sugar and salt into a large bowl. This is my special cornbread/pie crust bowl. 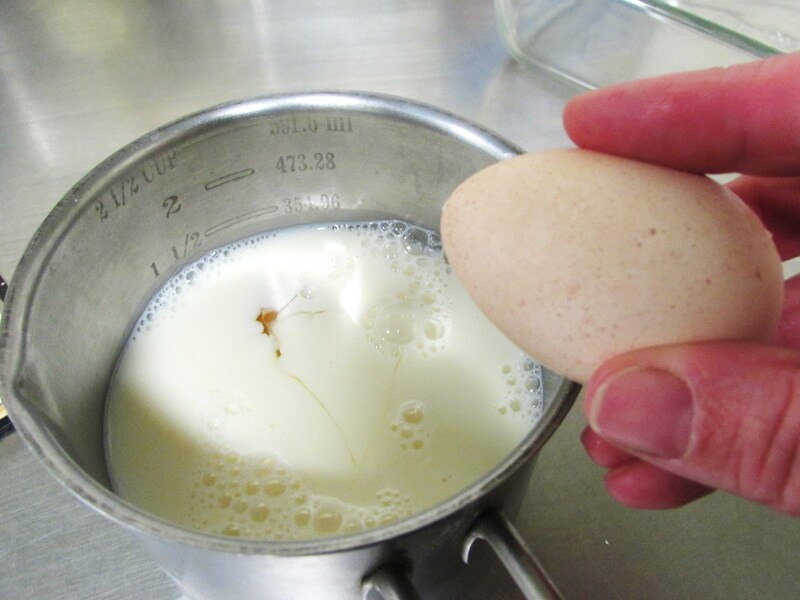 Next, grab a jar of milk…..
..and an egg..or 2 eggs if you have bantams like I do. 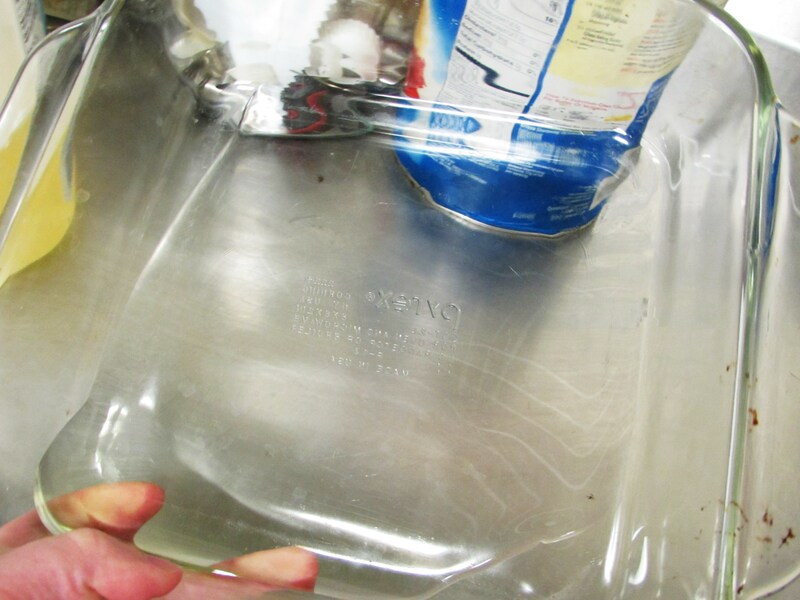 Now pour a little oil into an 8 inch square pyrex and swirl it around…. and stir that baby up! 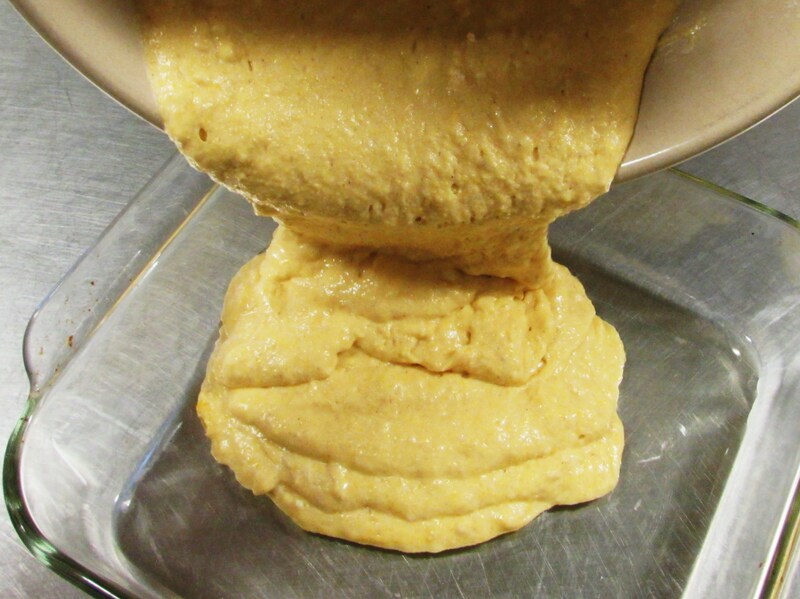 Pour it into the prepared pan…. 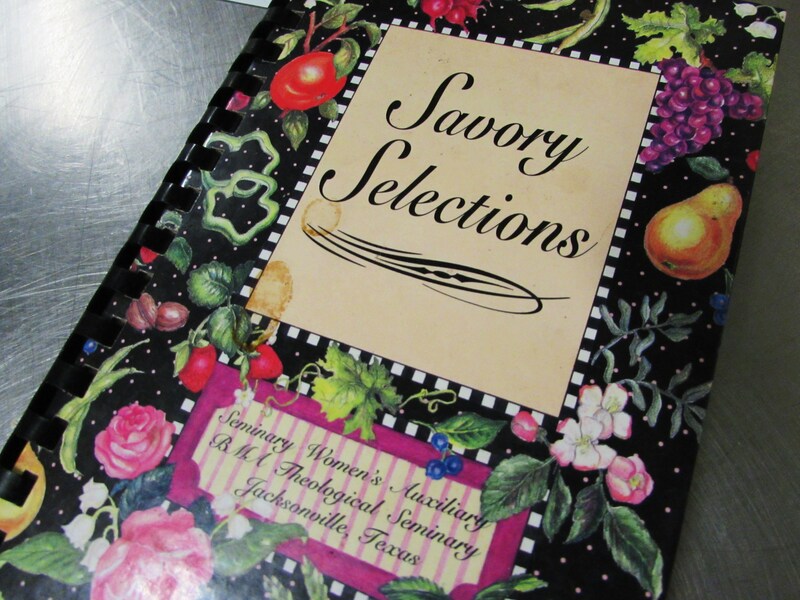 Now, slap some fresh butter on it and enjoy! Cornbread, I have found, is always better fresh and hot but it will keep for 2 or 3 days if you wrap it up tight. Chickens love leftover cornbread by the way…. Preheat oven to 425. 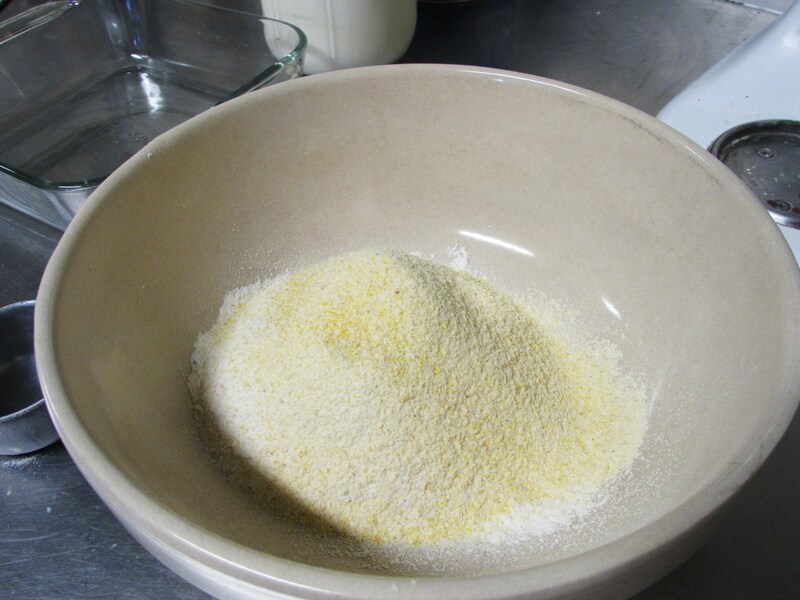 Sift the dry ingredients into a large bowl, set aside. 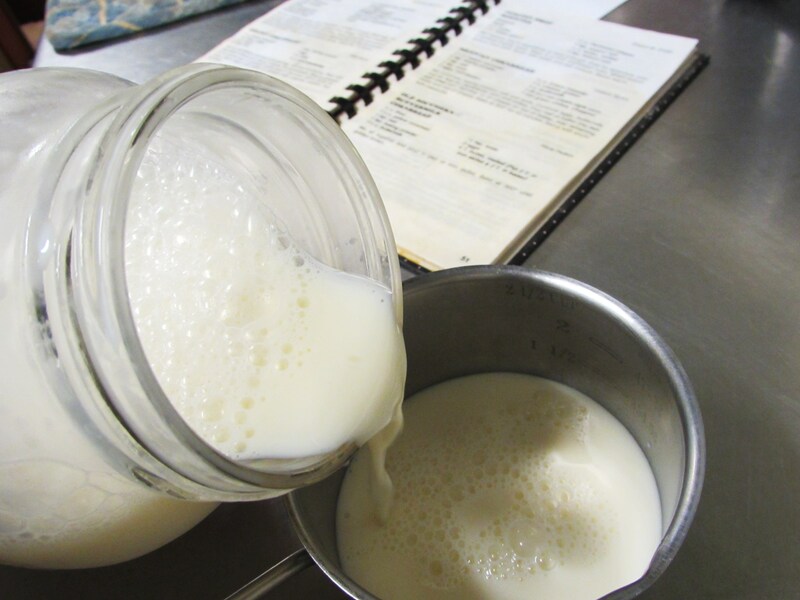 Whisk together the milk, eggs and Wesson oil. 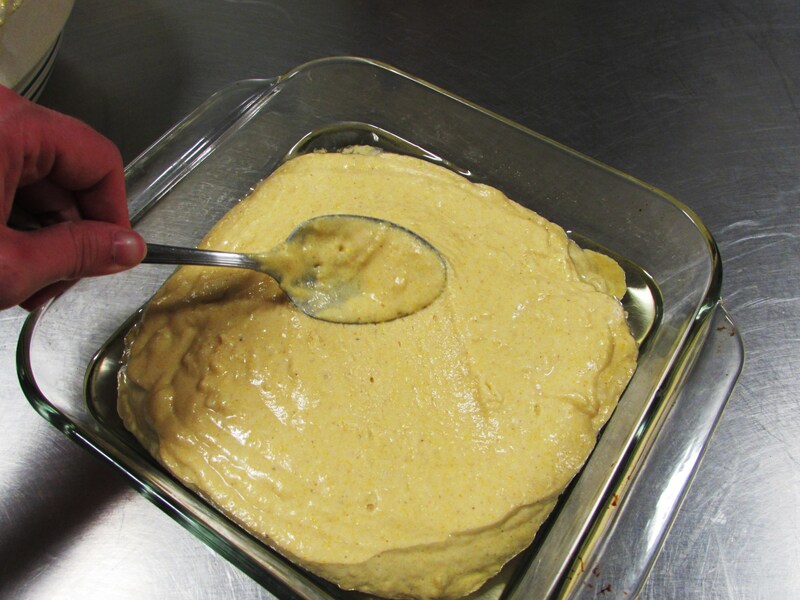 Pour a little extra Wesson oil into a 8 inch square glass baking dish, swirl around to coat the bottom and sides. 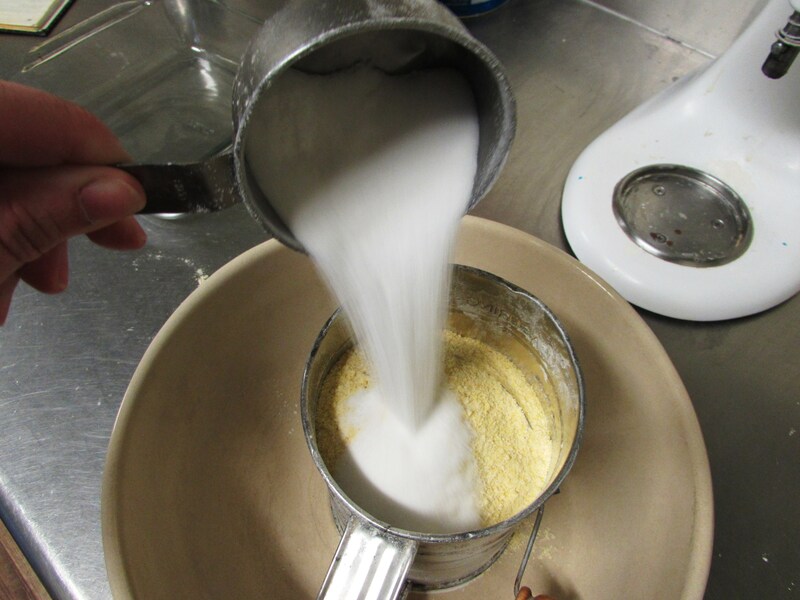 Add the milk mixture all at once to the cornmeal mixture and stir together until smooth. Pour into the prepared baking dish and bake for 20-25 minutes or until golden brown and a knife inserted in the center comes out clean. 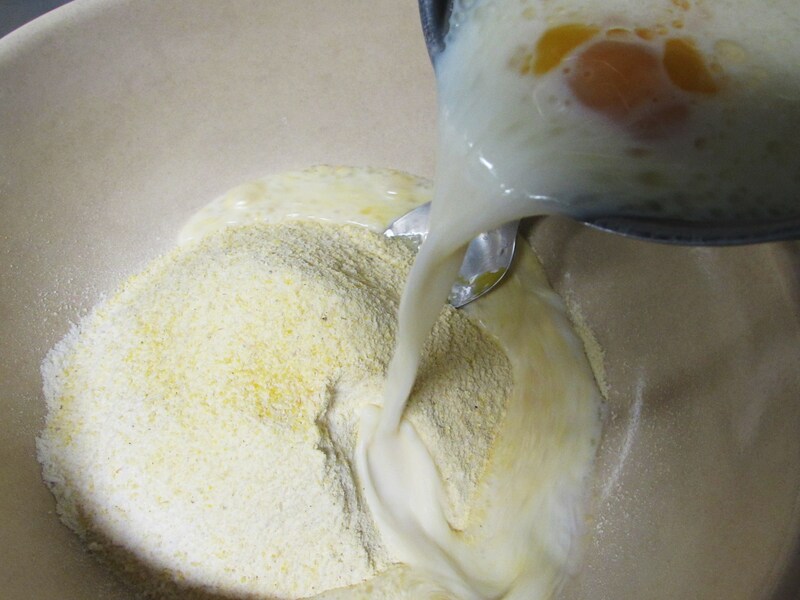 I am so making cornbread this week!